We’re exhausted as we reach Guatemala City airport. We’ve flown overnight, but on 2 shortish flights so for those who can sleep, there has not been much of it. We’re met at the airport by someone from our hotel – because we’re staying in Panajanchel, it seemed too challenging to get our exhausted 5 member family there on our own steam. The road is long and not altogether pleasant, and I’m just waiting for someone to feel sick. Benjy, our youngest, does not disappoint me in that regards and the long drive gets much longer, or just seems that way. This is a big trip for us. Big, not in terms of length, because we’re only going to be away for 2 1/2 weeks. No, big because this may be the last real family trip we take, and after so many of them, that’s a hard concept to grasp. Our kids are 15, 13 and 10 so it’s inevitable these family vacations will end at some point quite soon; already we now our daughter Dani, now 15, will spend next summer in Israel on a program. Also, we’ll be coming as close to immersion as we’ve ever done. We will do a week of Spanish lessons and live in someone’s house, a totally new experience. This is my wife, Liora’s idea. I’m happy to be a regular tourist, but all credit to her – she wants to dig deeper. I am of the right spirit though : I came home one day and Liora and Benjy told me we were going to Central America in the summer, and I agreed immediately. But mostly this may be our last trip for a while because my life has changed so dramatically over the last two weeks after we’ve heard that my dad in South Africa has been diagnosed with cancer. It’s very serious, and life since then has been consumed with Skyped chats, news from doctors, discussions with my brothers and research. It seems difficult to be out of contact as we will be, so let’s see how it goes. We stop at a little store for lunch but none of us is sure what the food is, so we leave it. By the time we get into Pana, it has started pouring and Benjy can’t take the car anymore, so he and I hop out on the main drag. It’s flooded with the downpour so we’re immediately soaked but that’s better than him throwing up. We skip through the puddles and find refuge in our hotel, Posada de los Volcanes. They’ve been very helpful with our travel arrangements and continue in the same vein, helping us with our luggage while we drip all over the lobby. It’s a nice, medium budget hotel, with an attractive garden courtyard and two floors. We’re in 2 rooms on the second floor and it’s there we stay to wait out the downpour. Luckily the kids find Jeapardy on tv so we all watch together. Eventually the rain abates and we venture out, but the road (Pana has one very long main drag, Calle Santander, and virtually the whole town, or at least the touristy part, seems to go off from it) is flooded so we just go next door for dnner before retiring for the night. 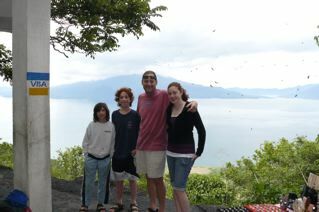 Friday morning, our first full day in Guatemala and we’re heading to Solala. 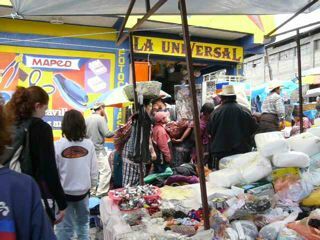 Although we’re going to the famous Chichi market on Sunday on the way to Antigua, Solala represents a chance to see something local and very authentic. And it really is. 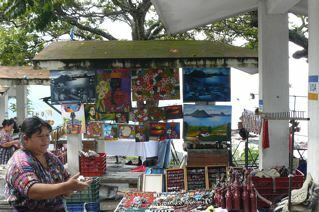 The Friday market attracts people from all over the highlands and it’s packed and amazingly colorful. 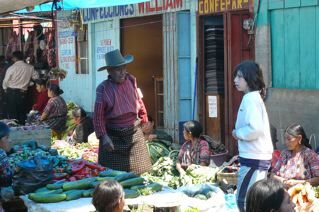 And REALLY authentic; in fact we’re the only fair skinned non locals we can spot. Our guidebook calls the market a ‘mesmeric display of color and commerce’ and it is. Liora, my wife, keeps her camera hidden like a concealed weapon. 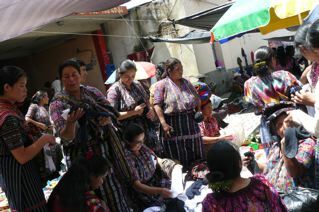 The local people are ornately and brightly dressed and it’s all a wonderful immersing experience. Although we don’t buy anything we all enjoy it thoroughly and are reluctant to leave when our driver calls. We head back to Pana. 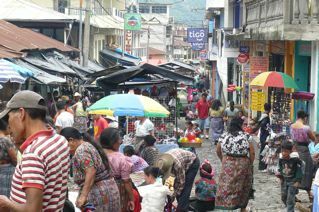 The main road, it turns out, is a kilometer long, so we stroll through it, looking at the shops, markets and foodstores. It’s not as colorful as Solala, but it’s not bad, and we linger for a while. The boys and I also share some excellent chicken empanadas. By mid afternoon the rain starts and the inevitable street flood, so we scurry back to the room for more Jeapardy. 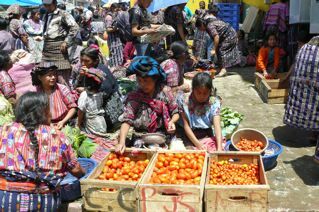 The following day we’re going to visit villages around Lake Atitlan. We get a boat across the lake to San Marcus, a little, quiet village we walk around for a while.When it’s time to move on, we jump on the back of a large pickup truck carrying other tourists for dirt cheap rates. 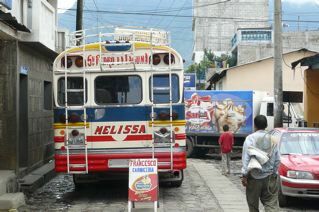 it’s a great novelty for us, and the truck drops us in the middle of San Pedro. We find the central market – now is probably as good a time as any to explain that markets are the number one attraction for our family : the one thing we all enjoy thoroughly. 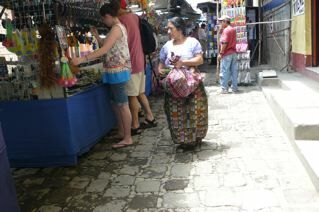 This is a loud, fun market and we pick up some pastries to munch on while we survey the different items on sale. We never buy much but we love the experience and this one is pretty good. When we take the boat back to Pana, we go looking for the Crossroads Cafe, regarded (by Rough Guide anyway) as the best coffee shop (another of our interests) in Pana, but more interestingly, owned by a South African (I’m South African). She is not in, but her partner is, and he won’t even charge us for our coffees which is a wonderful gesture. 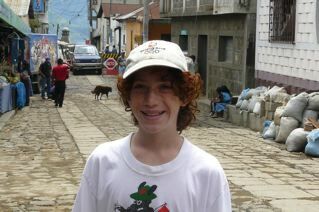 We walk around town – Pana is evidently not the best liked town for tourists, but we enjoy it – and have some more empanadas. We get a couple of tuk tuk “>tuks – it’s an anomaly that Guatemala has Thai tuk tuks – to the Nature Reserve. 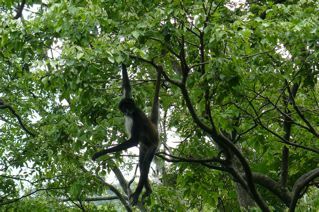 We’ve come to see the spider monkeys, and we do, lots of them ,but first we get bitten up all over by bugs before launching our rearguard action with bug spray. Just in time for the rain, and Jeapardy, we get back to our hotel where we hunker down for the evening.